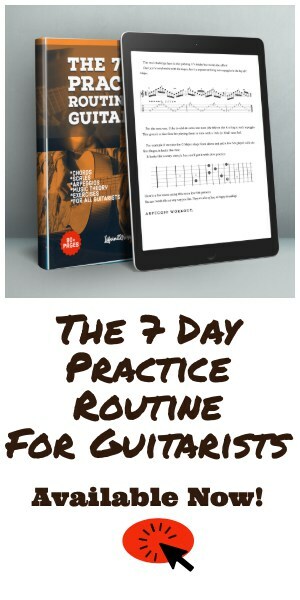 If you’re new to the routine, I highly recommend reading the first one that includes important instructions on how to practice the right way every time you pick up a guitar. 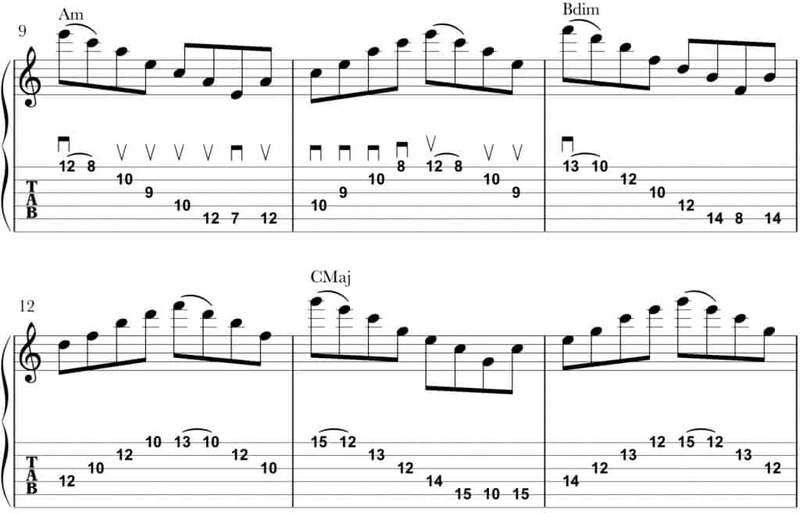 Routine #2, The Modal Workout delves a bit deeper into some basic scale theory that every guitarist should know. Otherwise, if you think you’re ready, lets get right to it! Before we get into the big & meaty arpeggio shapes, we’re going to start off with some simple triads. This lesson will be in the key of C Major/A minor. If you’re a beginner or even a more advanced player not familiar with these shapes, take a strum through them first without the picking sequences. 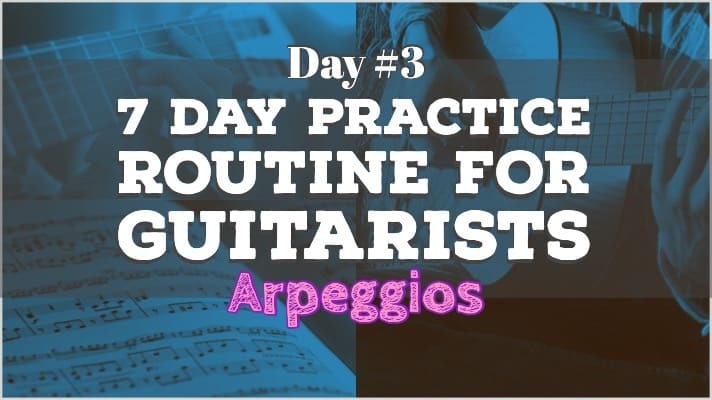 Starting in the 2nd position with A minor, we’re going to do a simple ascending/descending alternate picking sequence through all of the arpeggios. 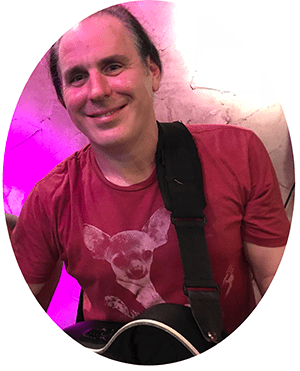 Set #1 – Alternate pick through the triads starting on the A note (2nd fret, G String), and continue through all of the arpeggios up the neck. If these triads feel even a little uncomfortable, go ahead and repeat each one 2-4x before switching to the next one. Set #2 – In an ascending triplet feel we’re changing the picking to – DOWN, DOWN, UP. Set #3 – In a descending triplet feel, switch to – UP, UP, DOWN. 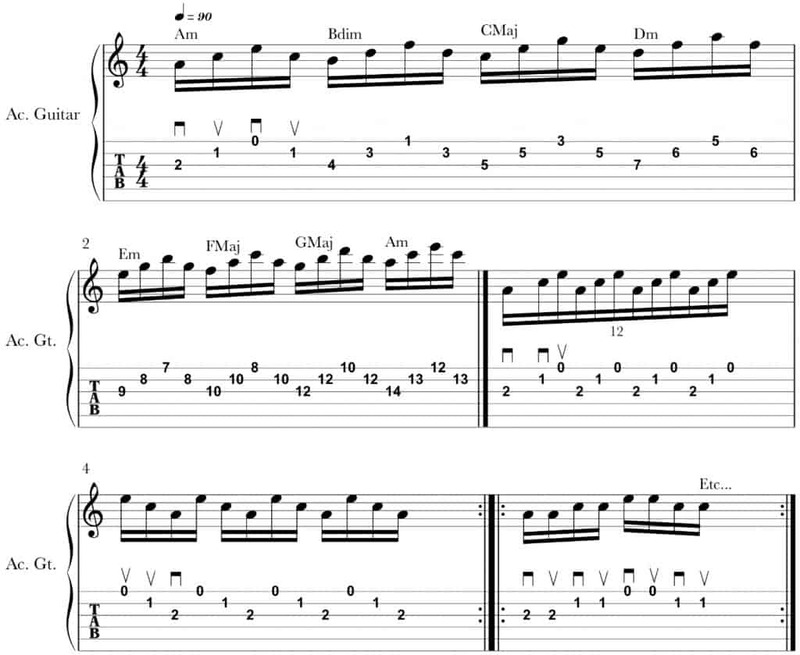 Set # 4 – “Double-pick” each note in each arpeggio ascending and descending. You can probably see where I’m going with this right? We’re going to do the exact same 4 sets, but move the triads “down” to the D string shapes. 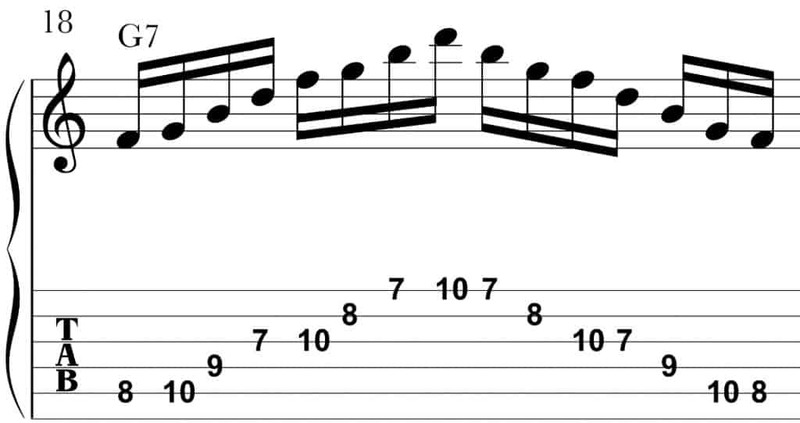 Starting on the E note (2nd fret, D String), build your arpeggios diatonically up the neck in the key of C Major. Do the same thing starting on the B (2nd fret, A string) and the G (3rd fret, low E string). For the purposes of this article, I’ll avoid the redundancy of putting all that repetitive music here. Get on my email list to be the first to get the FULL BOOK when it’s finished next month. Ahhhh, sweep picking. Most guitarists either love it or hate it. I’m kind of on the fence really. I mean, if I see someone doing it well and in a tasteful manner, it is cool. Most of the time though, it’s out of place in just about any style of music outside of Progressive, Fusion or 80’s era Metal Styles. It just seems silly outside of the Metal genre. Sure, you’ll impress someone with it. It’s flashy and sounds incredibly difficult when executed properly. Personally, I think the only people you’re impressing with sweep picking are the same types of people impressed by Bud Lime, Frank’s Hot Sauce or Pizza with cheese in the crust. Ooooh. You’re definitely not impressing good guitarists. If you haven’t gotten the other, more important facets of your playing together ie,. Chords, Rhythm, bending, good note choices etc., al. It seems kind of silly to be over-using this advanced technique. Now, as for the merits of Sweep picking… let’s talk about the wonderful side benefits such as syncing the hands. It really helps! Sweep picking is also wonderful for your upstrokes. That being said, if you’re a Metal Guitarist and assuming your playing in a Metal band, ignore everything I just said and SHRED. 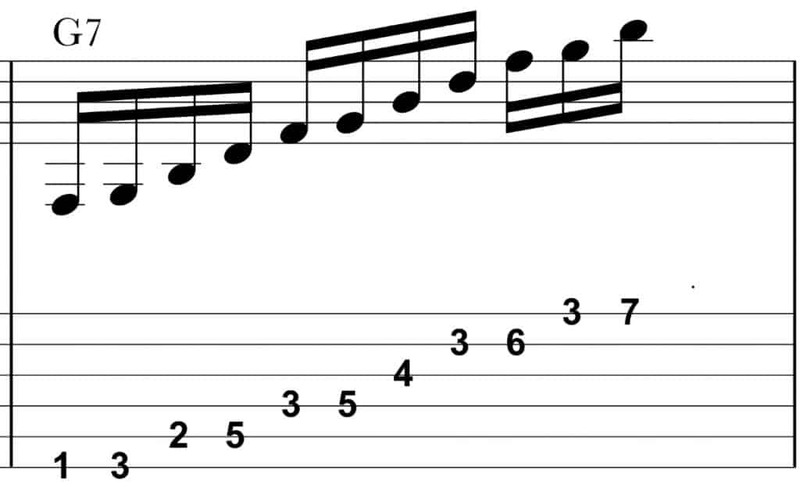 This first set consists of an A String root, 1 note per string except for 2 notes on the high E. These are the most common “shredder” era shapes. The real challenge here is the picking. Notice when doing the C Major shape below, the picking changes on the second run. Essentially you’re “sweeping” ascending with all downstrokes. You’re hitting that pull-off with an upstroke, sweeping descending with upstrokes, THEN.. starting on a downstroke on the D String. It’s tricky but worth the effort. Once you’re comfortable with that, here’s a sequence utilizing more arpeggios in the Key of C Major. For this one I like to add an extra low note (the 5th) on the A string to each arpeggio. This gives it a nice flow for playing them in time with a 16th (or 32nd) note feel. You can tweak that out any way you like. They are a lot of fun, so happy shredding! These are really the meat & potatoes of my improvising tools. 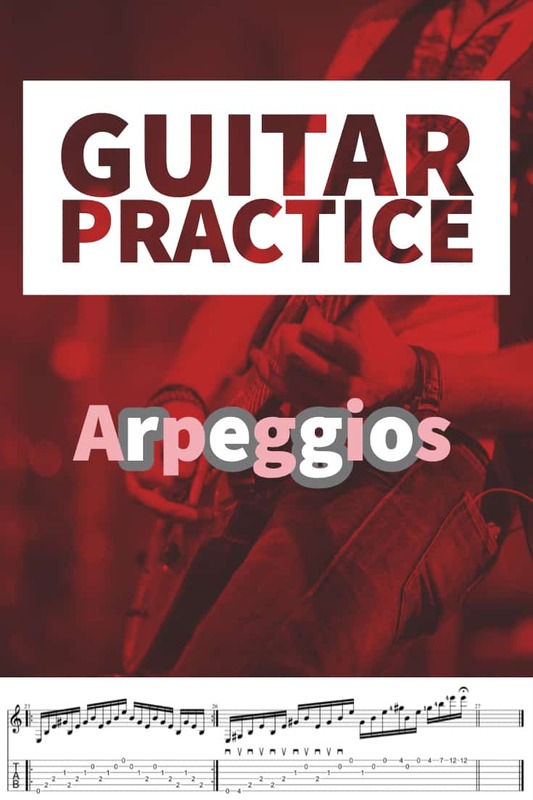 Along with Modal scales, Diatonic 7th Arpeggios provide an excellent framework for improvising in just about any music style. I find it easier to memorize these in different places by thinking of a “behind the root” and “in front of the root” shape. 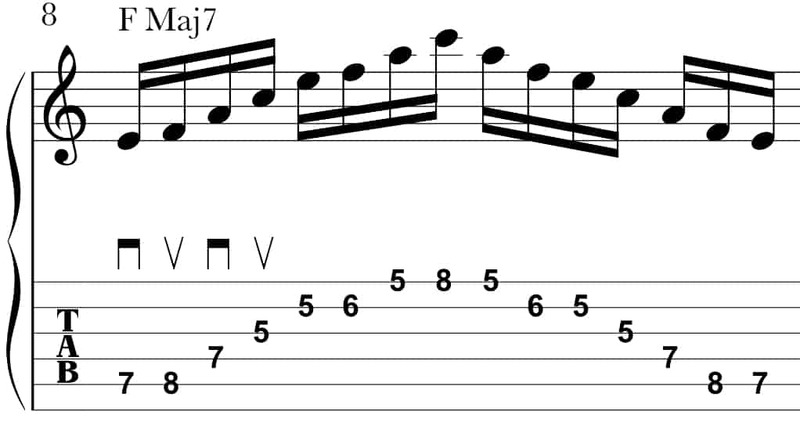 In the 5th position starting on the (D) note you can take that Dm7 arpeggio in either direction on the neck. Of course, you can map out your own shapes just about anywhere you want, but I prefer shapes with the root on the (A) String. You can use the above shapes for the 2nd, 3rd and 6th degrees of the Key. For the Key of C that would be: Dm7, Em7 and Am7. Starting on the 3rd fret (C note, 7th of Dm7) alternate pick ascending through the arpeggio shifting at the top and descending in the “in front of the root” shape. This is a great technique for coming up with some tasty licks in your improvisations. You can use the below sequence/shape for the I and IV of every key. In this case: C Major7 or F Major7. The 5th chord/arpeggio of any key is a Dominant 7th. It’s just a Major chord with a flat 7th added. In the Key of C Major, the V chord is G7. I’ve always liked this one across 6 strings. Very Eric Johnson-ish. Don’t forget to alternate pick! For the VII of every key you’ll use the minor7b5 arpeggio on the (B) note. Sometimes referred to as 1/2 diminished, this arpeggio really exploits that dark diminished/Locrian sound. 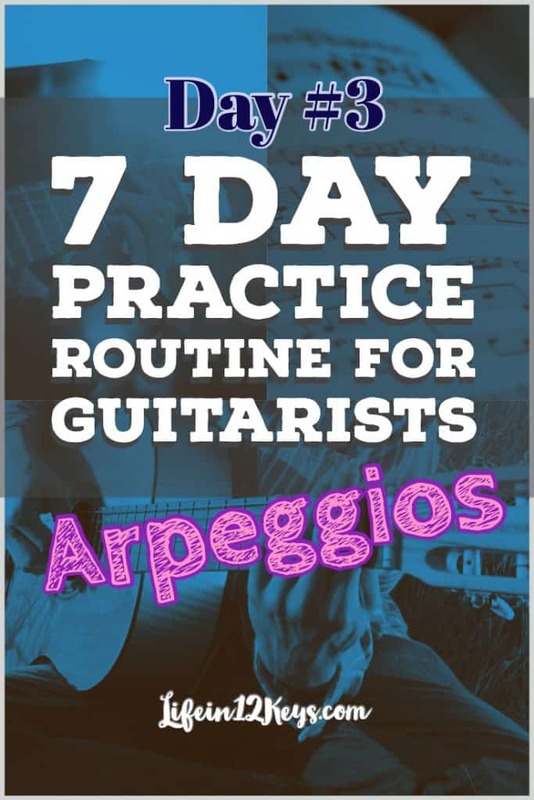 7th arpeggios can give you a wide array of sounds. You can play them with a Key Center approach by just mixing and matching sequences you like. They ALL work in the key regardless of what the chord progression is (assuming the chords are in the Key of C). You can also use them for a more focused sound. For example, playing an Am7 arpeggio over a Dm7 chords gives you a D minor 11th sound. Jazzy right? With this type of approach, you’re kind of forcing the listener into a certain sound by superimposing one chord/arpeggio over another in the same key. You can go nuts with that little nugget of info and try different combos that sound good to you. Think of the lines and spaces on the Treble Clef when memorizing the notes in arpeggios. F-A-C-E… Hey, that’s an F Major 7! Remember that saying when you were a kid? Pretty cool right? I know it helps me in times of doubt (or too many beers). If you haven’t read my previous articles, I can’t stress it enough. Always practice with a metronome. Practice with both clean and distorted tones.